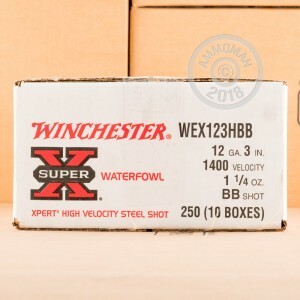 This 12 gauge ammunition is a must-have for large waterfowl hunting. 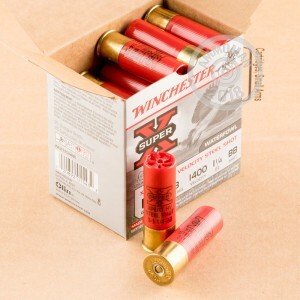 Each 3" shell in this box of 25 propels a 1-1/4 oz. column of steel BB size shot to a muzzle velocity of 1,400 feet per second. The large size of the BB shot gives it better penetration and makes it ideal for bigger game. 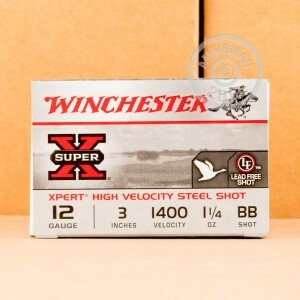 These shells are manufactured in Oxford, Mississippi, home of Winchester ammo production since 2011. Like ot her entries in the Super-X series, they use reliable 209 primers and one piece hinged wads that help keep patterns tight and reduce recoil--a useful trait in a 3" load like this one. Stock up on all types of ammunition at AmmoMan.com and earn free shipping on any order over $99!